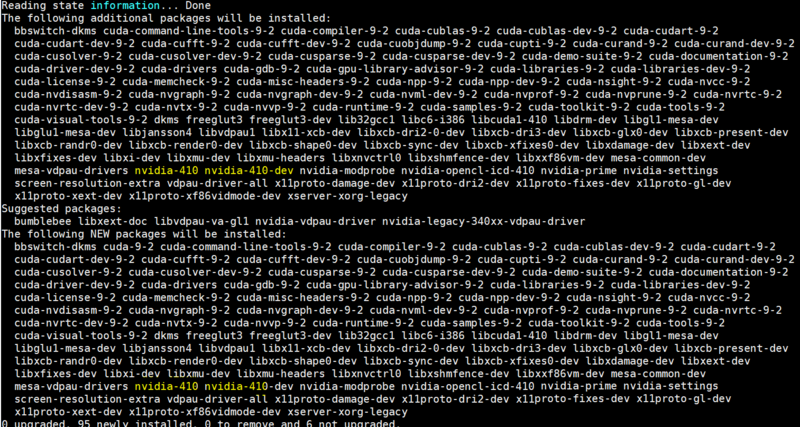 I'm trying the CUDA 9.2 and drivers 396 configuration but the drivers that sudo apt install cuda-9-2 installs are the 410. How can avoid that? Unfortunately with the NVIDIA repo, it installs the newest driver that is in that repo. At the time I wrote the answer that was the newest one there, then they recently changed it. So, to do the older driver you will have to download and install the CUDA 9.2 manually. You do have to follow those instructions very closely. Install NVIDIA Accelerated Graphics Driver for Linux-x86_64 396.37? Not the answer you're looking for? Browse other questions tagged drivers nvidia bash cuda gpu or ask your own question. How do I install NVIDIA and CUDA drivers into Ubuntu? How to solve 'ERROR: An NVIDIA kernel module 'nvidia-uvm' appears to already be loaded in your kernel'?